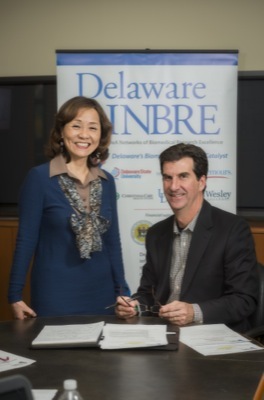 1:24 p.m., Jan. 6, 2014–Leadership appointments have been announced for the Delaware IDeA Network of Biomedical Research Excellence (INBRE). This statewide program is building Delaware’s biomedical research capability by developing research in the areas of cancer, cardiovascular health and the neurosciences, providing key research resources and enhancing the biomedical science and technology knowledge of the state’s workforce. Since its inception in 2001, the program has secured $45 million from the National Institutes of Health (NIH) and $5 million from the state of Delaware to renovate laboratories and to develop shared or “core” instrumentation centers. The program also has supported over 50 biomedical pilot research projects and trained hundreds of students at partnering academic and clinical institutions across the state. Steven Stanhope, associate vice provost for research at the University of Delaware, has been appointed the program’s principal investigator (PI). Cathy Wu, the Edward G. Jefferson Chair of Bioinformatics and Computational Biology at UD, has been named program coordinator, and Eric Kmiec, chair of the chemistry department at Delaware State University, is the program’s research director. Stanhope, professor of kinesiology and applied physiology in UD’s College of Health Sciences, was named associate vice provost for research at UD this past fall. In this role, he reports to the vice provost for research and is charged with providing University-wide leadership on UD’s campus, as well as across its partner organizations, to enhance the biomedical research infrastructure and to advance orthopedic rehabilitation for wounded warriors. Formerly co-principal investigator for Delaware INBRE, Stanhope was appointed PI when the program’s former PI, Karl Steiner, departed UD in September to become vice president for research at the University of Maryland, Baltimore County. As part of his duties, Stanhope chairs the program’s management team, which includes representatives from Christiana Care Health System, Delaware State University, Delaware Technical Community College, Nemours/A.I. duPont Hospital for Children, Wesley College and UD. An expert in orthopedic rehabilitation and biomechanics with projects underway in the U.S. and abroad, Stanhope joined the UD faculty in 2007 after 22 years at the National Institutes of Health, where he founded the Physical Disabilities Branch. Currently, Stanhope also directs the UD-led BADER Consortium, a research partnership funded by the Department of Defense to investigate optimal rehabilitation care for wounded warriors. The consortium brings together researchers and health professionals from UD, Harvard University, the University of Texas at Austin, Christiana Care Health System, Mayo Clinic, Naval Medical Centers in Portsmouth, Va., and San Diego, San Antonio Military Medical Center, Walter Reed Army Medical Center, C-Motion Inc. in Germantown, Md., and the University of Michigan. As program coordinator for Delaware INBRE, Wu oversees the program’s centralized research instrumentation, bioinformatics focus, and undergraduate research experiences and professional development activities. Wu is a pioneer in bioinformatics, a field that uses sophisticated computational techniques to store and analyze vast amounts of genetic data, shedding light on connections within biological systems that may illuminate disease pathways, for example. Prior to joining the faculty of UD’s Department of Computer and Information Sciences in 2009, Wu was a professor of oncology and of biochemistry and molecular biology at Georgetown University Medical Center. Wu established and directs the Center for Bioinformatics and Computational Biology (CBCB) at UD to promote, coordinate and support interdisciplinary research and education in bioinformatics and computational biology. She also leads the Protein Information Resource (PIR), which supports genomics, proteomics and systems biology research. Wu also directs the doctoral program in bioinformatics and systems biology at UD, in addition to master of science and professional science master degree programs in the field. As research director, Kmiec chairs the INBRE Research Committee, composed of senior faculty members and researchers at the partner institutions. A major goal of this committee is to mentor junior faculty and develop their capability to independently submit and win competitive NIH research grants. Kmiec, who serves as the principal investigator of INBRE at Delaware State University and heads DSU’s Laboratory of Chemical Genomics, is considered a pioneer in gene editing, a technique in which synthetic DNA molecules are used to patch or repair mutations in human chromosomes. His research focuses on the development of molecular tools to treat genetic disorders, particularly rare or “orphan” diseases. His most recent biotechnology company, OrphageniX Inc., located in Delaware, focuses on gene editing in inherited diseases such as sickle cell disease. In 2012, Kmiec was awarded the Unsung Hero Research Award by the William E. Proudford Foundation for Sickle Cell Disease. Prior to his arrival at DSU in 2011, Kmiec served as eminent scholar and founding director of the Marshall Institute for Interdisciplinary Research at Marshall University. From 1999-2008, Kmiec was professor of biology at UD and director of applied genomics at the Delaware Biotechnology Institute, after spending 10 years at Thomas Jefferson University’s National Cancer Institute Center of Excellence.